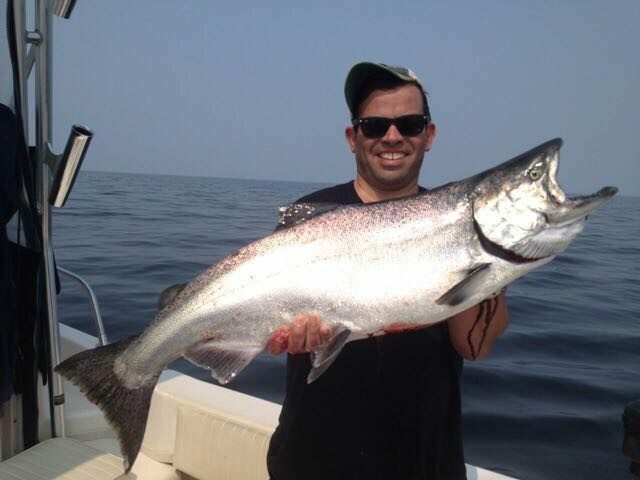 Captain Eddie’s guests were from Miami yesterday and landed this beauty while fishing on the other side. Well we are approaching the half way mark of August and there is a lot to report on, so let’s get right to it. Let’s talk about pinks. It hasn’t been a red-hot year for us trollers, but the beach guys are finally getting some action. 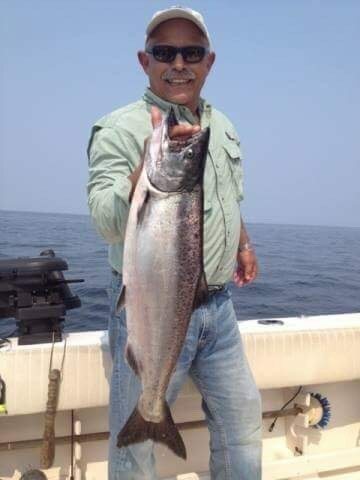 Fishing off the Cap Mouth has been pretty good for pinks and coho. Things are now pretty consistent off Furry Creek up in Howe Sound as well. It was definitely a late start but maybe things will continue later on than normal as because they started late. My friend Trevor is vacationing up around Campbell River and Courtenay in his usual beach spots and things are also unseasonably slow there for pinks. The good news is that he spotted large schools of pinks in the middle of Strait, heading south with good speed, so that is good news for us. This could be more Squamish River and Indian River fish or it could be some Fraser fish as well. Either way, some are on the way, so that is great news. There have also been some reports of pinks off the North Arm of the Fraser, but this is just the beginning of the run, as the Fraser pinks don’t really show up in big numbers for about another week. Coho fishing off West Van perked up for a few days mid week off the flats but much like the pinks, it hasn’t been a banner year, at least as of yet. More fish will be stacking up off West Van flats and the Cap Mouth in coming weeks and there is no significant rain in the forecast, so hopefully the back end of August is more productive. White hootchies and anchovies have been producing best for these fish. I just took a look at the Albion test set numbers and the numbers of chinook entering the Fraser is steadily climbing, as one would expect for this time of year. Often the peak fishing is around the 3rd week of August so we do expect fishing to become more consistent as the month progresses. We have been getting some nice chinook at the Bell Buoy lately. Bait is key for these fish and 30-80 on the riggers has been productive. UV and chrome flashers and teaser heads on your top rods and glow flashers and teaser heads on your bottom rods will get the job done. The early to mid component for Fraser chinook this year is weak, but the brood stock year for the later returning fish was quite large, so we have our fingers crossed that we will see some good returns of chinook to the Fraser in the last 2 weeks of August and the first week of September. There are also some nice fish being caught on the other side. 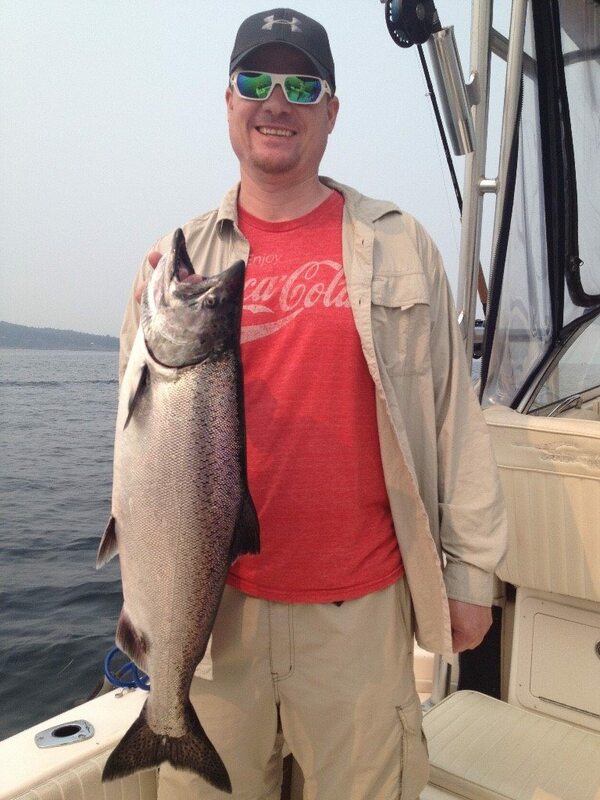 We have a few spots in the Gulf Islands where we have found some bait and some nice big chinook. We can’t get into specifics, as the spots are small, you are fishing extremely deep, and with only a few boats it can get quite crowded. That being said, if we are on 10-hour trip and the wind is light, we have been heading across and dropping our gear down to 220-260 with 18-pound cannonballs and getting some good springs. As the Fraser fishery picks up we will be less inclined to run across as it is a long run there and back and fishing that deep is always a challenge. Productive setups for us when fishing this deep have been glow flashers, double glow flashers, and glow splatter back hootchies in green and blue.